212 customers have given this product a 5-star rating. Of these, 201 customers have written no texts or given their feedback in another language. 157 customers have given this product a 4-star rating. 120 customers have given this product a 3-star rating. 51 customers have given this product a 2-star rating. 35 customers have given this product a one-star rating. 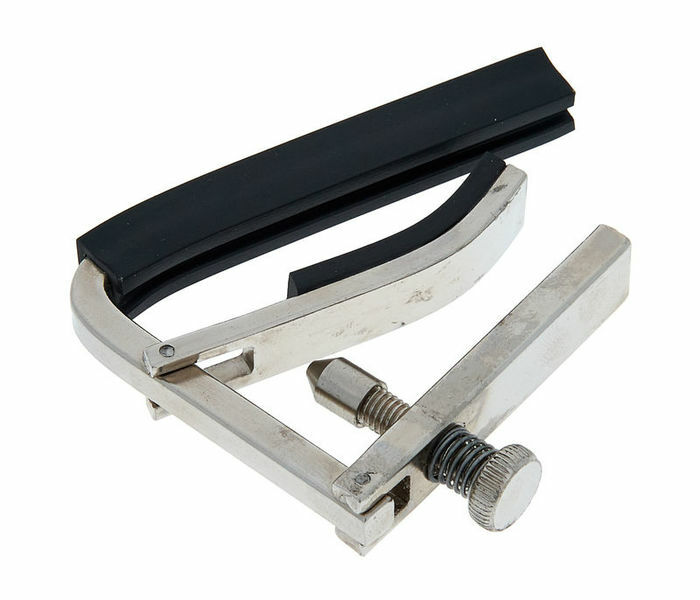 I have used a Fender spring operated capo for a long time. At first it was great, easy to put on. But after a while the spring lost a lot of its tension so it doesn't really work anymore. That however won't be the problem with this capo, since it is basically friction that holds it together. It is a little trial and error to get the screw tension right, but not that hard. I use it mainly on my acoustic guitar, and I won't be going back to spring operated capos anytime soon. Really good capo for a tiny price!!! I read the comments after I made the purchase. In the comment people mentioned that their rubber are falling off. I thought I might have the same problem. But fortunately not!! Mine is perfect! It holds the strings really well, and the rubber seems to be glued really well. Maybe they need to add more quality control on this product. ID: 226849 © 1996–2019 Thomann GmbH Thomann loves you, because you rock!